AdWords payments system is based on auctions. 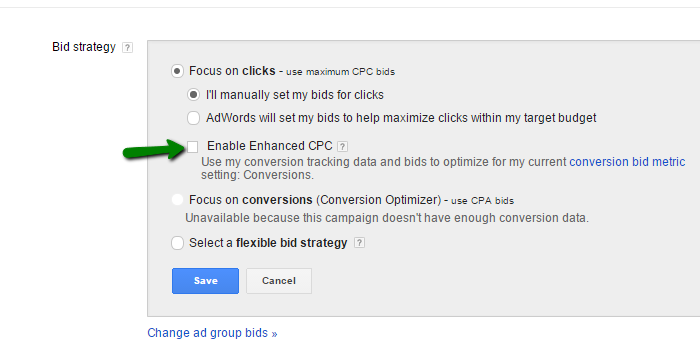 The auctions help AdWords decide where and when your ad will appear. When you create an ad, you set up a bid, i.e. the costs you are willing to pay for that ad. This bid is one of the things used by AdWords program to determine which ads to show, as well as how to rank them. Cost per click (CPC) bid is the maximum cost you are willing to pay for a click on you ad. This is not necessarily the price you will pay, as sometimes the costs can be lower, depending on the bid. When setting up higher bids you are more likely to be ranked higher and receive more traffic, but you will spend more money. Lower bids can result in fewer clicks, and thus fewer conversions. When setting up the campaign you need to have clear goals in mind, in which way you want to improve your business. These goals also affect your bid. Advertisers may focus on clicks, impressions, or conversions. If you are creating a campaign for the first time and you really have no experience in setting up the bid, you will have to be intuitive and determine the initial bid yourself for the first time. What you need to have in mind is that bid changes constantly. The bidding price is influenced by both searches and the bidding price of the other advertisers who are competing for the same keywords. This means that you have to monitor your campaign and adjust bid accordingly in order to maximize the efficiency of the campaign. When you set up a bid, you basically indicate the maximum amount you are willing to pay, but this is not necessarily the price you will end up paying. For example, let us say you set up your initial bid to be $5. This means that the most you will pay for the ad being posted is $5. If this bid places your ad first in the list of ads, and the advertiser below has set up the maximum bid $3, you will also pay $3. Here is another example. If you have set up your bid to be $8, and you end up paying $8, this means that the advertiser below your ad is also using high bidding price. As the costs in this case are too high, you might want to consider lowering your bid. It may happen that you lower your bid to $6 and that you end up paying only $1. Even though your ad will be placed second, you will be paying less as the third advertiser has set up a low bid. This is a great way of reducing the costs so you should bid the smart way, but you really have no way of knowing it, until you have tested different options. Regular monitoring is especially necessary if you are experimenting with the bidding strategy, as the situation can turn around quickly. The third advertiser can increase bidding which will push you ad to the third position, or it may even happen that new advertisers show up with higher bids which would require you raising the bid as well. While bidding price is an important factor for search engines when determining ranking, it certainly is not the only one. Quality score is as equally important and it affects ranking of ads, as search engine want to deliver only relevant ads. This means that if your quality score is very low, even the high bidding price may not help you to rank your ad. Quality score plays an important role when it comes to determining the ranking of ads in the search engine result pages. Automatic bidding – This is an easier solution, and thus it is recommended for beginner users in Google AdWords. In this case, you set up daily budget and AdWords program will adjust CPC bids in order to generate the most clicks with the available budget. Manual bidding – If you want to be completely in charge of your bids, you will use this option. 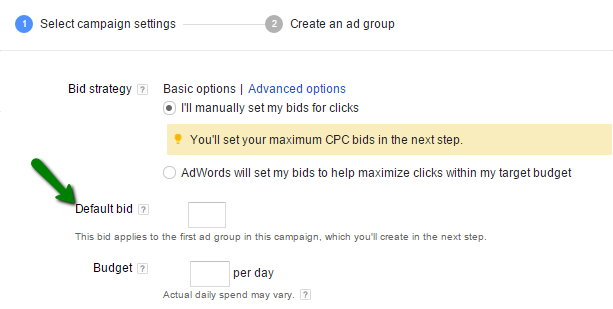 Here you will be able to set bids for different ad group levels, for different keywords or ad placements, etc. In this case, you will be able to select to bid only for those ads or keywords that are most likely to result in conversions. The second type of bidding is the bidding focused on impressions. Unlike with the previous type of bidding, where you would pay only when someone clicks on your ad, in this case you are paying for the number of times your ad was shown to the users. This type of bidding is called cost per thousand impression (CPM) bidding and it means that you pay every 1,000 times your ad appears. This method is used with Display Network campaign type only, and it is good for focusing on branding and promoting your logo and company name. CPM bidding is available for “All features” subtype, and for remarking options, which are both used when advertising with Display Network campaign. The third type of bidding is the one that focuses on conversions. It is called cost per acquisition (CPA) and in this case you only pay for conversions, also called acquisitions. This is an advanced bidding method, often recommended to intermediate and advanced advertisers. First you need to determine what conversion is for you. It may be a particular action on your site, such as sign up, visiting a particular page, online purchase, etc. Even though in this case you still pay per click, AdWords will automatically set bids for your account, in order to maximize the number of conversions, as this is the goal you have specified when you were selecting the bidding type. This type of bidding is called enhanced cost-per-click (ECPC) and the idea with this bidding option is to help you get more value from your budget. If you use this option, your bid will raise when it seems that those clicks are more likely to lead to conversions on your website. This feature detects the ads that are more likely to lead to sales and it raises bid up to 30% in order to compete for those clicks. Have in mind that you need to enable conversion tracking for your campaign in order for this option to work. This feature is available for text ads on the Search Network and Display Network, except for mobile app downloads. If you want to enable this option, go to the campaign for which you want to edit settings, click on the “Settings” tab, find the option “Bid strategy” and mark “Enable Enhanced CPC”. Depending on your strategy, you can create a default bid and use it in one or several campaigns, or you can choose to edit bids for ad groups separately. Thus, there are several ways to set up a bid. When you start to create a new campaign, you will see an option to add default bid. This means that the bid you set here will be used for this campaign, including all of the ad groups and individual ads. And you can also change bid on keyword level. Unless you specify a custom bid, the default bid will be used for every keyword. Using the shared library option, you can create bidding strategies that can later be applied in the campaign. Use “+Bid strategy” button to create a new custom bidding strategy. 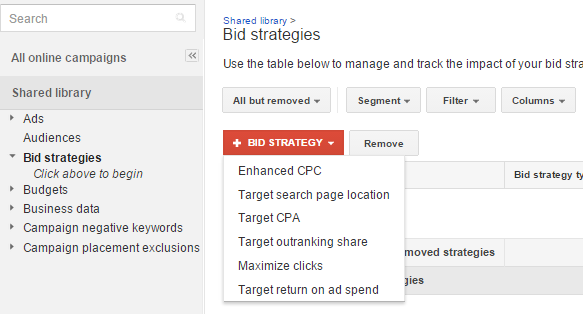 Custom bid strategies help you focus on maximizing clicks, enhanced CPC, etc. Go to the campaign settings to choose one of the bid strategies you have created, and then apply the strategy on campaign, ad group or keyword level. Budget helps you determine how much you will spend on the AdWords campaign. In most cases you will set up daily budget, which is the amount of money you will pay per day. AdWords program will adjust this budget with bidding option you have chosen in order to determine how often your ad will be shown per day. In general, you pay the amount you have set as your budget. Occasionally, costs may exceed your daily average budget up to 20%. This may happen in cases when there is higher search traffic on a particular day, which means that AdWords will show your ad more times and thus exceed the daily budget, but the ad may be shown fewer times during the days with low search traffic. Since AdWords program is designed to maximize the return on the investment (ROI), the program will optimize your campaign so that it takes advantage of the high volume of search traffic. You should not try to use budget to control your costs, but instead, use bidding for this purpose. Bidding offers creating custom bid on campaign, ad group, ad or keyword level, which helps you customize the campaign and completely control your costs, while budget should be used as a general indicator to Google on how much you are willing to spend on your campaign. If you are new to AdWords program, you should set up a budget based on your planning, as you want to make sure that your strategy fits the plan you have initially designed. However, if you have a lot of experience in working with AdWords, and you know how to control your campaign using bidding options and keyword matching types, you should try setting up higher budget. In this case, you increase the amount of money you are willing to spend, but as said, this does not mean that you will actually spend all of that money. Having set the campaign in the way that it results in high number of conversions, you can easily increase the budget in order to try to maximize the number of conversions. Being an experienced advertiser, you know that if the campaign is set up properly, higher budget will only increase the efficiency of the campaign. Budget can be set when you create a campaign, and you can change it at any point during the campaign. Daily budget is the amount of money you are willing to spend per day on your campaign. Google AdWords tries to optimize the daily budget with the campaign settings you have chosen so that the ad is displayed as often as possible within that budget. Occasionally, you might be charged less or more than your daily budget. You can access the budget setting when you create a campaign or use the “Settings” tab in the campaign to edit the budget. Shared budget is used for multiple campaigns. If you run several campaigns, and you do not want to manually assign individual daily budget for each of them, you should choose the option shared budget. In this case, AdWords automatically adjusts the budget that is allocated to different campaigns. You can switch from shared budget to daily budget for individual campaign at any moment. In this case, even if you have the shared budget for multiple campaigns, you will still be able to limit the costs by using different bid.